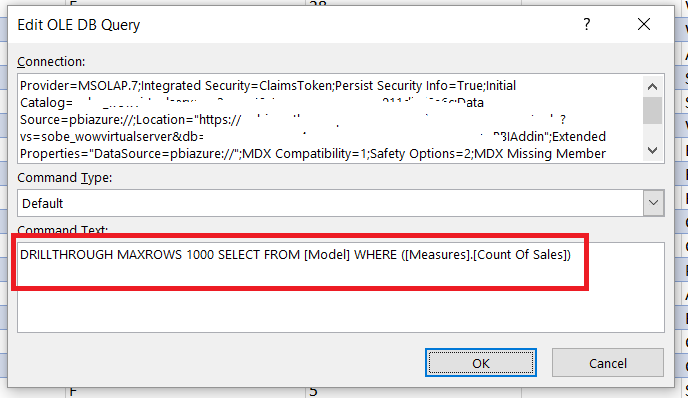 The first mistake that all new Analysis Services Tabular developers make is this one: they create a new project in SSDT, they connect to their source database, they select the tables they want to work with, they click Import, and they then realise that trying to load a fact table with several million rows of data into their Workspace Database (whether that’s a separate Workspace Database instance or an Integrated Workspace) is not a good idea when they either end up waiting for several hours or SSDT crashes because it has run out of memory. You of course need to filter your data down to a manageable size before you start developing in SSDT. 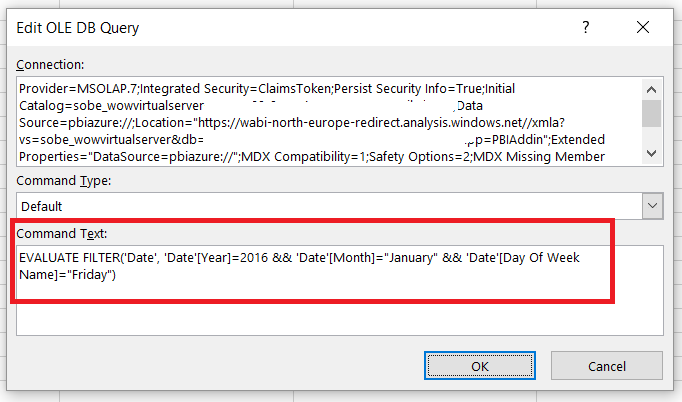 Traditionally, this has been done at the database level, for example using views, but modern data sources in SSAS 2017 and Azure Analysis Services allow for a new approach using M.
Note that at the time of writing there is a bug in the Query Editor in SSDT that means that when you create a parameter, close the Query Editor, then reopen it, the parameter is no longer recognised as a parameter – it is shown as a regular query that returns a single value with some metadata attached. Hopefully this will be fixed soon but it it’s not a massive problem for this approach. And yes, query folding does take place for this query. What happens when you need to deploy to development though? 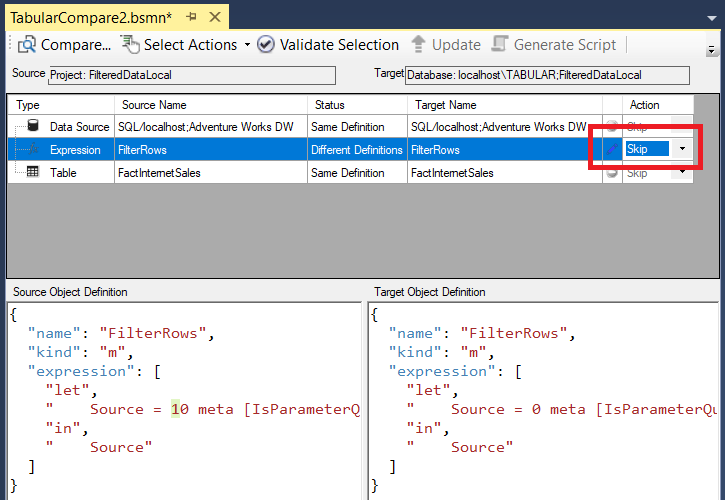 At this point you should go back to the Query Editor and edit the FilterRows parameter so that it returns its original value, so that you don’t accidentally load the full dataset next time you process the data in your Workspace Database. I’ve played around with it a bit and I’m very impressed – it’s a really sophisticated and powerful tool, and one I’m going to spend some time learning because I’m sure it will be very useful to me. 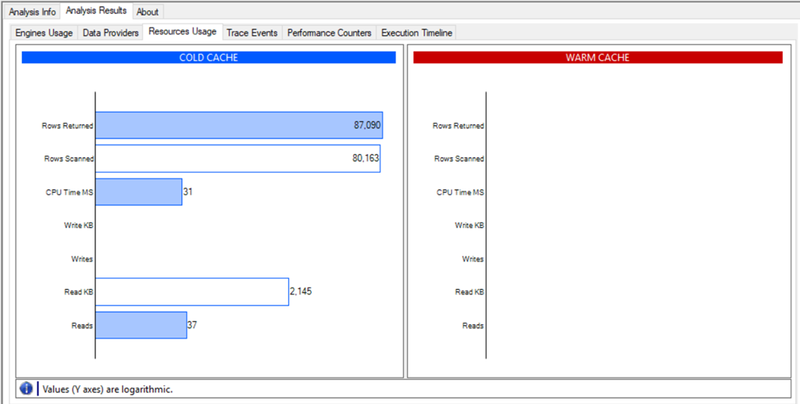 It’s an AddIn for SQL Server Management Studio and captures Profiler and Perfmon data for an MDX query when you run it, does so for a cold and warm cache, and then displays the results in a variety of graphs and charts. And it even has an MDX formatter built in! You can find a full list of features here, and when you download the tool it comes with very detailed documentation. Definitely a must-have for all serious SSAS Multidimensional developers. Writing M in the Advanced Editor in Excel or Power BI can be a frustrating experience unless you’re the kind of masochist who loves writing code in Notepad. 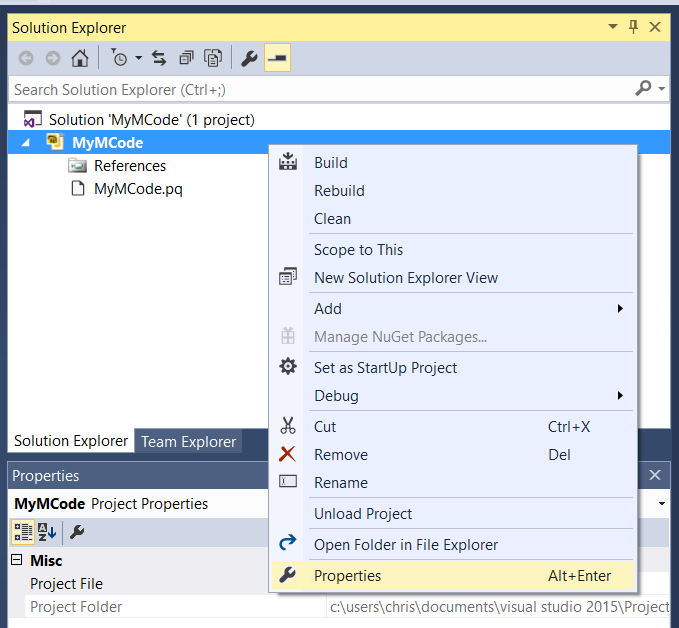 There are some options for writing M code outside Excel and Power BI, for example Lars Schreiber’s M extension for Notepad++ (see here for details) or the M extension for Visual Studio Code (available from the Visual Studio Marketplace here; more details on Brett Powell’s blog here), but the trouble with them is that you have to copy the code back into Excel or Power BI to run it. 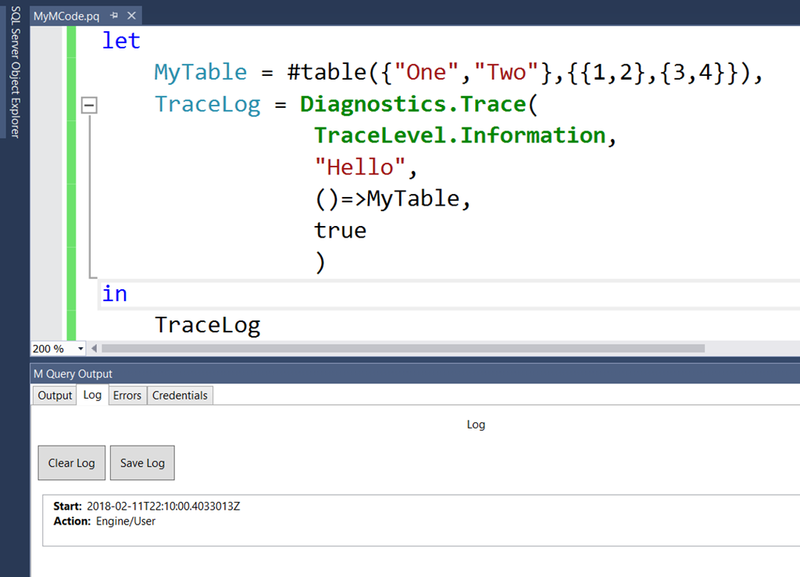 What many people don’t realise, however, is that it is possible to write M code and have IntelliSense, formatting, keyword highlighting and also the ability to execute your own M queries, using the Power Query SDK in Visual Studio. 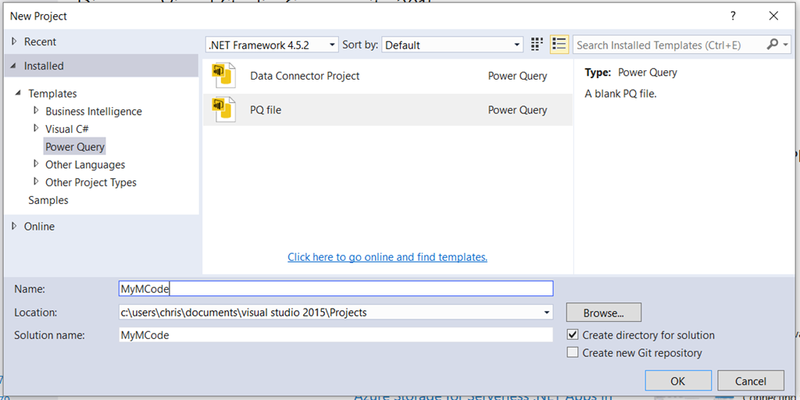 The Power Query SDK (which you can download here) supports Visual Studio 2015 and 2017 and is intended for people who are writing custom Data Connectors for Power BI. 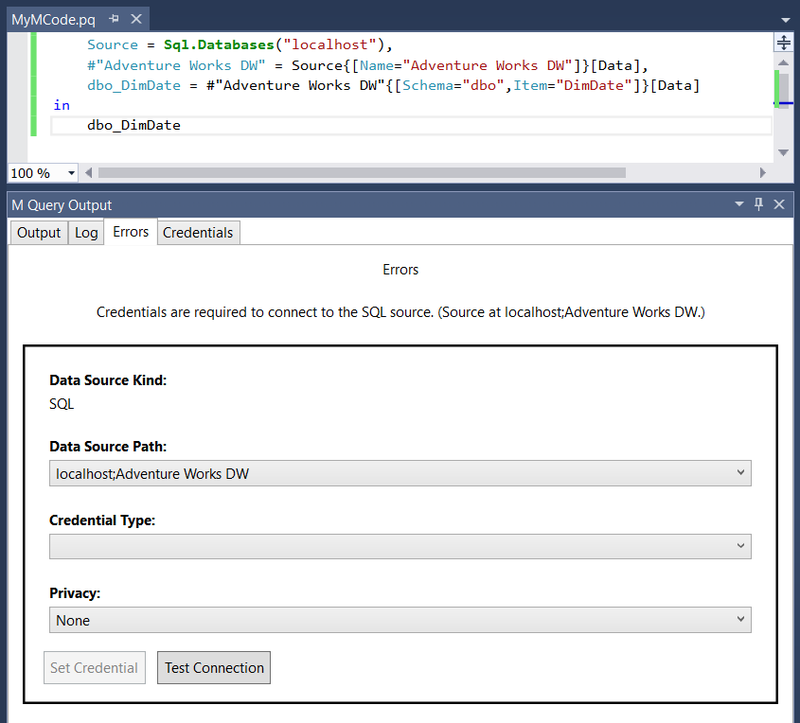 To let you test your Data Connector you can create a .pq file containing M code, and this in fact allows you to run any M query you want whether you’re building a Data Connector or not. Many of the properties are self-explanatory, at least for anyone used to writing M in Power BI or Excel. FastCombine turns off data privacy checks. 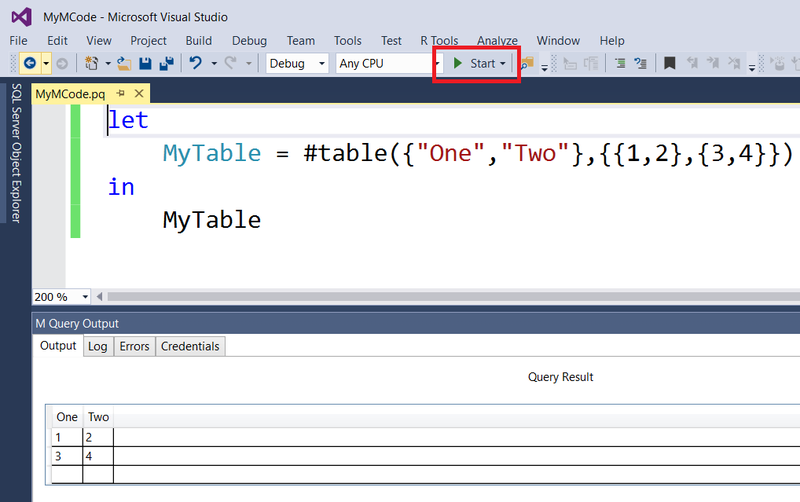 Allow Native Query lets you use M queries that contain ‘native’ queries (for example your own SQL queries if you’re using a SQL Server data source), as Cédric Charlier shows here. A few of them, such as Legacy Redirects, I have no idea about yet (I should really ask someone…). 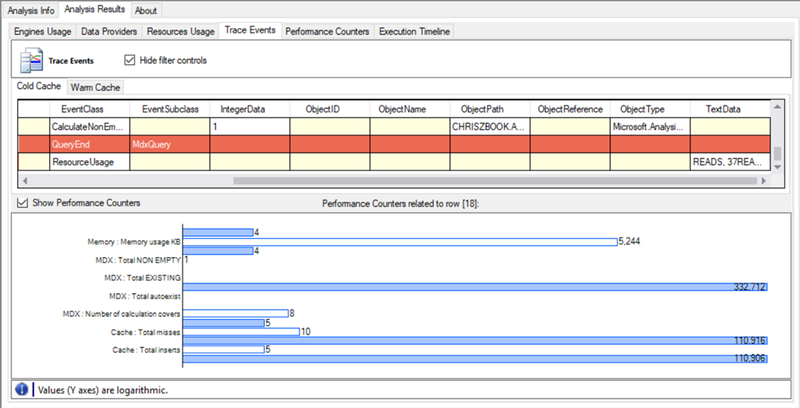 Turning on Show Engine Traces displays engine trace information in the Log tab of the M Query Output pane; turning on Show User Traces displays trace information generated by the use of the Diagnostics.Trace() function in your code in the Log tab. You can save the contents of the Log tab to a text file. 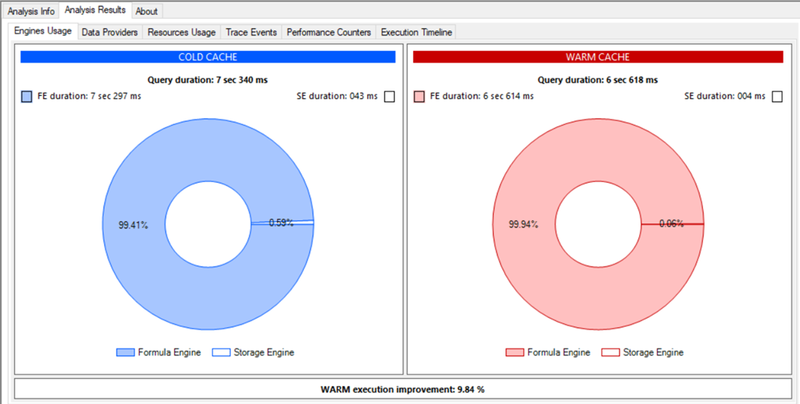 The query won’t actually run this first time though; you’ll need to hit Start/F5 again to see the results. If you close the project and then reopen it you will need to enter credentials again; alternatively, on the Credentials tab you can save the credentials used for a data source to a .crd file which can then be reloaded when you reopen your project. 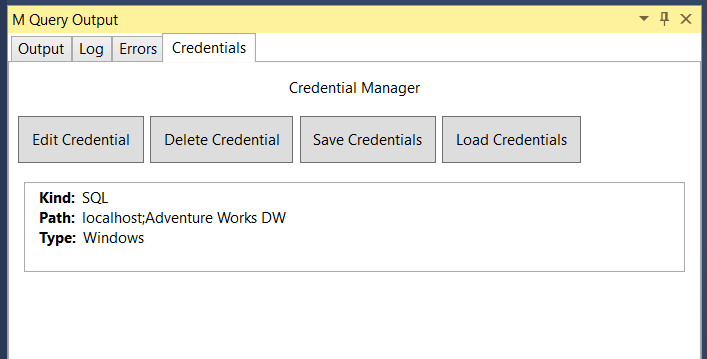 You can also edit and delete credentials on the Credentials tab. If I’m honest it’s all very basic but it does the job. 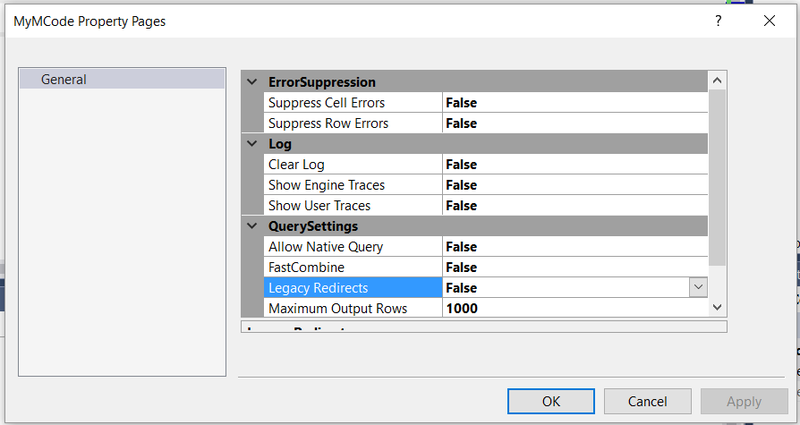 The main thing that I miss from writing M code in Power BI is the Query Editor UI – when I write M code there I only write about 50% of it manually, the rest I generate by clicking buttons in the UI because it’s faster. Give me the Query Editor (or the ribbonless version of it that comes with SSDT, because Visual Studio doesn’t support ribbons apparently) and I’ll be happy. Even better, give me the improved code editing functionality in the Advanced Editor in Power BI Desktop and Excel that we’ve been promised! We’ve all met them: the users whose idea of a ‘report’ is a large table of data dumped into Excel. However many beautiful data visualisations they see, however many times you try to convince them of the benefits of using Power BI to build reports, they just want to know where the “Export to Excel” button is so they can carry on analysing data in the same old way. Sometimes there’s a valid reason for doing this, sometimes not, but all too often internal politics means that you have to accommodate them. What’s more, clicking a button to export data and then copying it into an Excel report is a time-consuming, error-prone, manual process that no-one likes doing. 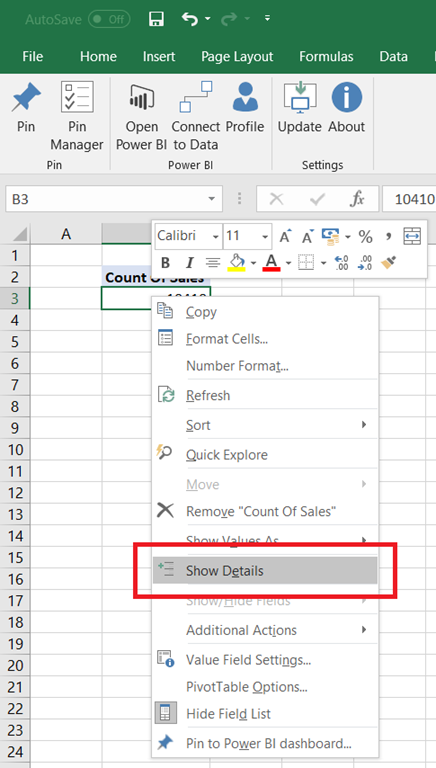 There is another way to get data from Power BI into Excel though: using the Analyze in Excel feature. 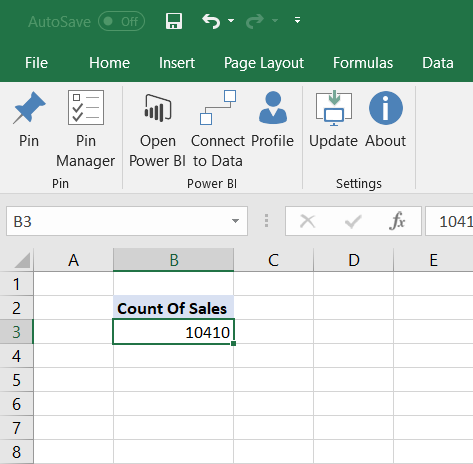 Rather than using Analyze in Excel to create a PivotTable, which may suffer from the subtotals issue described here if you aren’t using the click-to-run version of Excel 2016 and as a result may be very slow when dealing with large amounts of data, and which will be awkward to get data out of because you have to use Excel functions like GetPivotData(), in this post I’ll show you how to get data from Power BI into an Excel table instead. 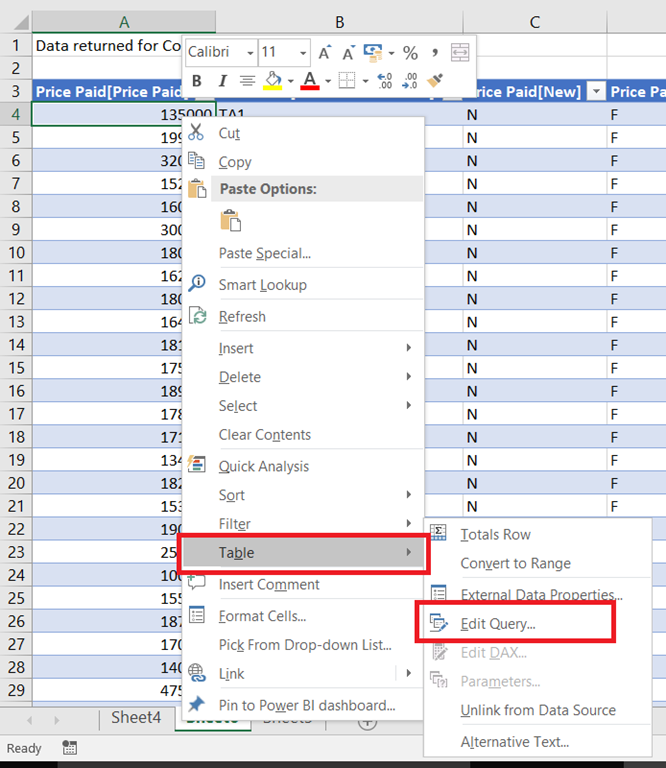 First of all you need to create a PivotTable in Excel on your desktop that is linked to a dataset published to Power BI. 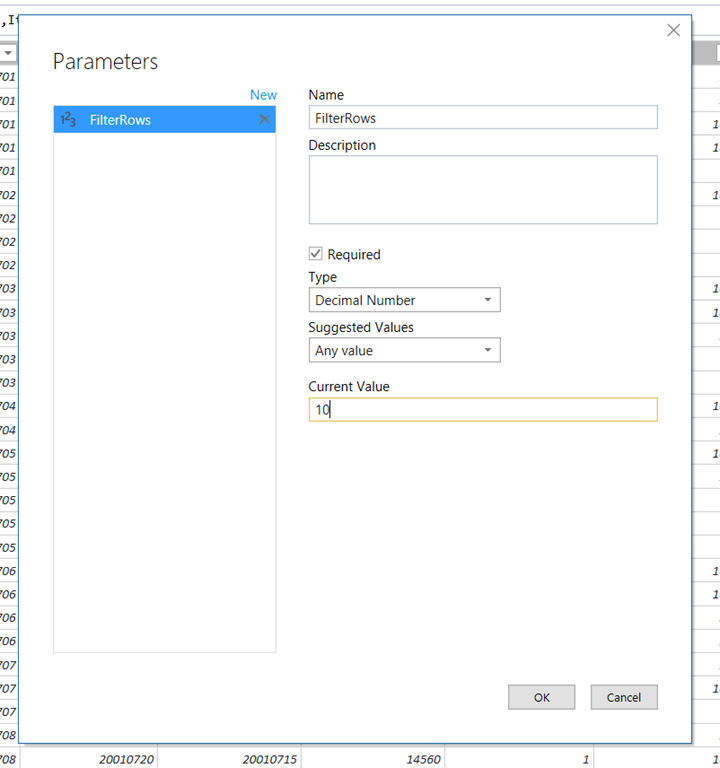 You can do this either by clicking the Analyze in Excel option from inside the Power BI service in the browser (see here for how to do this), or by using the Connect to Data option in the Power BI Publisher for Excel add-in. When you do this a new worksheet will appear with a table in it containing rows of data from a table in the underlying dataset, but the exact data is irrelevant here. 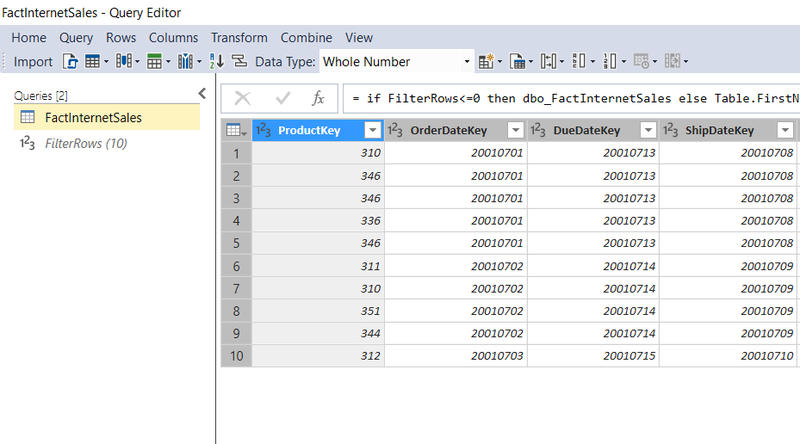 The real point is that you now have an Excel table (not a PivotTable) with a connection back to your Power BI dataset and you can edit the query that it uses to return data from Power BI – a variation on an old trick known to SSAS and Power Pivot users. You can now delete the PivotTable you created because you will no longer need it. You can replace this statement with any MDX or DAX query you want – I recommend using DAX queries here because they are likely to be easier to write if you already know how to write DAX calculations, and unlike MDX queries they return a tabular resultset. I have a fairly old series of posts on DAX queries here that will help get you going. It will be a good idea to install DAX Studio and write your queries there, then copy them into Excel when you are happy with them. One minor annoyance is that the column names will be in DAX ‘Table Name’[Column Name] format, and although you can use the SELECTCOLUMNS() DAX function to alias your column names and thereby remove the table names, the square brackets around the column names will always be there. 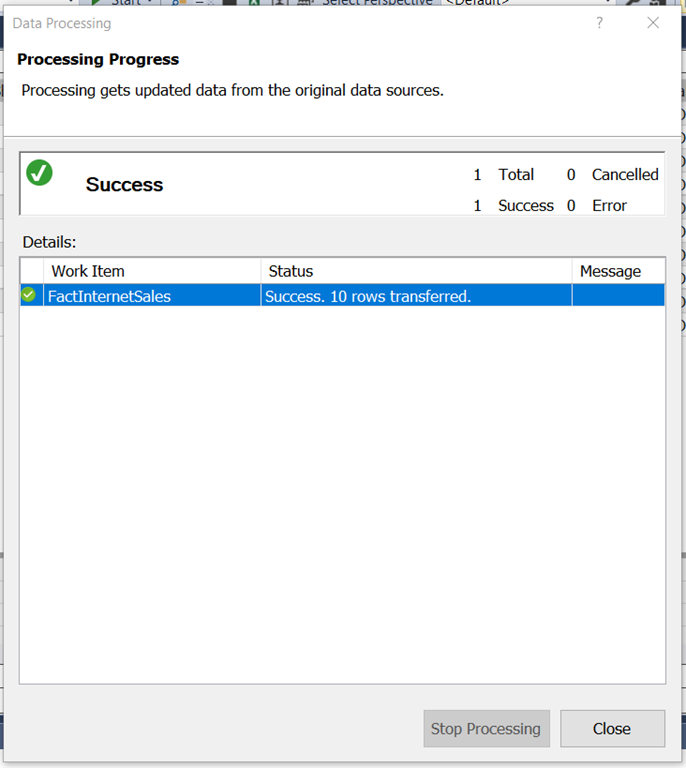 There’s no easy way to pass parameters to the queries you use, and so allow the user to choose what data is retrieved from Power BI. I guess it would be possible with some VBA, though – I haven’t tried – and it may also be possible to connect Power Query/Get&Transform to the Power BI Service and then use some of the tricks I show in this video for building reporting solutions in Excel. You can of course use Excel’s own native table filtering functionality to filter the data that is downloaded. 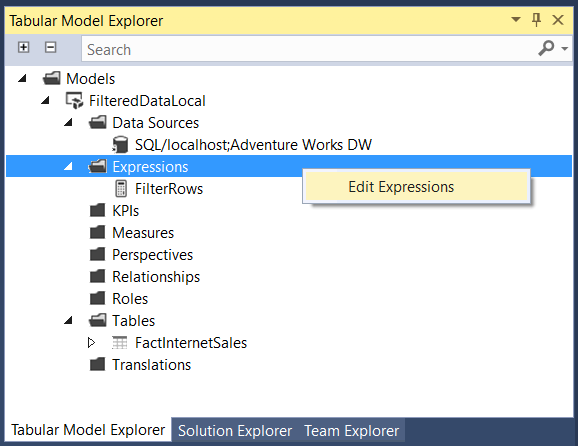 Writing DAX can be complex, whether it’s a DAX query or a calculated table, so another option would be to use the Power BI Query Editor to create the table you need for your report, load that into your dataset and then load the table into Excel. 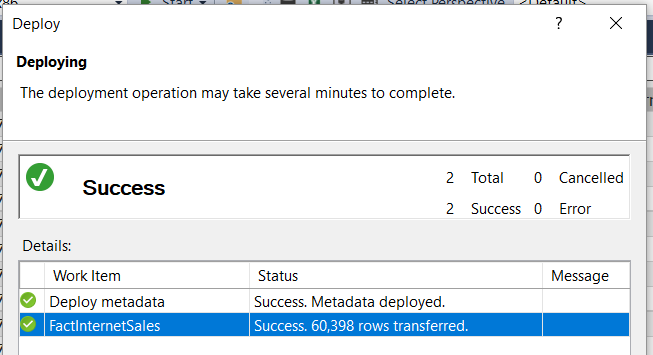 You can’t publish the Excel workbook up to Power BI and have it refresh automatically, because of course Power BI does not support connections from published Excel workbooks back to Power BI datasets. Hopefully this will change in the future – it marked as planned on the Ideas forum.